Gold jewelry created broadcast their brilliance on edge and are sure to attract attention. Name of this collection of gold jewelry ephemeral: Many tribal jewelery gold ephemeral board: 7 (see photo). For that price, receive 7 gold jewelry ephemeral. Click on the image for a larger picture of gold jewelry! Attention here is a world exclusive jewelry 24k gold ephemeral. Indeed, a co-branding between jacking and DeLafée Heart (Swiss company specializing in luxury gold) was born a collection of 24 karat gold jewelry ephemeral! Gold jewelry are made ​​of real 24 carat gold, and the best cosmetic ingredients. These ephemeral gold jewelry extremely fine harmoniously follow all the contours and movements of your skin. 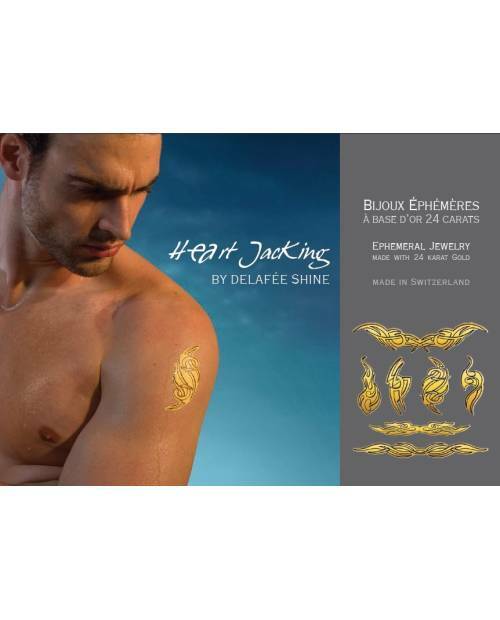 The gold jewelery Heart jacking / DeLafée applies easily to the body by a decal process. Advice and explanations of attachment of your jewelry will be sent with your gold jewelry. Applied as directed, the 24 carat gold jewelry will keep all its beauty and luster for several days, since the ephemeral gold jewelry is water resistant.